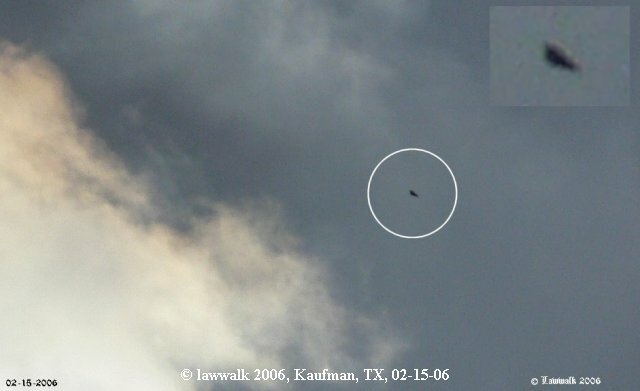 February 18, 2006 – East Texas. Around 16:00 I photographed the clouds in the rays of the sun. If at the moment of shooting the sun is in a certain position, clouds are painted in incredibly beautiful colors, like in this picture. Then, in the left part of the photograph, between the clouds, I noticed some kind of object. As I said, some of the objects I see, some are not, but the camera sees them all. When shooting, especially with the zoom, I have often noticed that these objects are moving very quickly and by the time when I clearly see and want to take a picture, they disappear from the frame. I know that things that usually appear around the clouds and moving very quickly, leaving behind a trail, but if you photograph them, at times, manages to capture them.